The crowds were enormous at the Mecca of tourism, - The Louvre Museum in Paris on the next day after Christmas. After having seen the best of the world’s priceless collections of Leonardo Da Vinci, Raphael, and other geniuses across the Greek, Roman and French civilizations, I was returning back. I paused for a while and looked back. There she was, as if ‘Mona Lisa had just turned alive’. Poring over her mobile phone, and next moment, lifting her head in a disarming smile. I could immediately place her as I recognized her companion from the pictures I had seen earlier. ‘Ranjana, I exclaimed’, with almost certainty in my voice as I moved forward. ‘I was just trying to recognize you from the picture in my mobile phone’ she replied with delight. What a lovely surprise, to meet a blogger friend with whom I had only interacted on blogs and Facebook pictures! My memory took me back a few years when her elder sister, also a blogger then based in Bengaluru, had invited me over her ( Ranjana’s) wedding! How time had flown, and here we stood speaking as if it were long lost friends. I introduced them to my family and time flew as we exchanged notes and pleasantries in a corner under the huge glass pyramid of The Louvre. The world has really shrunk and become small, no wonder. How could one otherwise explain meeting someone in a distant land for the first time in this manner. At least this was an experience that I was unlikely to forget any time soon. Having landed in the city of love- Paris on the Christmas eve, twice I had escaped, the nefarious plan of pick pockets, who in identical manner had tried to rip me off! The ingenious ploy was that while boarding the metro, one from the gang, would block the movement by dropping his spectacles on the floor and bending as if to pick it up, and while I stood transfixed, the other accomplice would reach for picking the pocket. On the first occasion on the Christmas day, I raised an alarm and they immediately sensed the danger and rushed out of the metro before the gates closed. It was quiet an unnerving experience. Still, we were joking about the incident on the next day as we boarded the metro when exactly the same sequence of events repeated at the same venue on our outward journey to the Louvre. Since, this time I was a little better prepared, I pushed the accomplice who tried to reach for my pocket, while his companion picked the spectacles and moved out of the compartment. A nasty experience, but having traversed enough in crowded metro of Delhi, I denied the robbers their Santa Claus moment of walking away with a gift of my purse! So, one has to be well prepared for such eventualities while traveling abroad. The incident was soon forgotten after having, met the wonderful blogger friend and her husband and what now remains are beautiful memories of the short meeting. That pickpocket incident is a shocker though you did great to fend them off. :) Seems like a wonderful trip mixed with adventure and surprises. Good places have few dark spots as well but as long as we are lucky all is good:) Meeting blog friends brings back the memories of our meeting! Good job with those people who were trying to pick your pockets. Thank you for the warning. Thanks Divya for that beautiful comment! Look forward to meeting you too. Have a great New Year! Wishing you and family a happy New Year too! Oh, I have seen such kind of trickery only in the movies. Thank God, you and your wallet were safe. I wish to meet you someday. It's a different kind of experience to meet someone whom you read and know through the virtual world. In Ranjana's case you have met earlier, though. So nice to hear from you Saru in the New Year. The trickery on the metro was almost surreal! 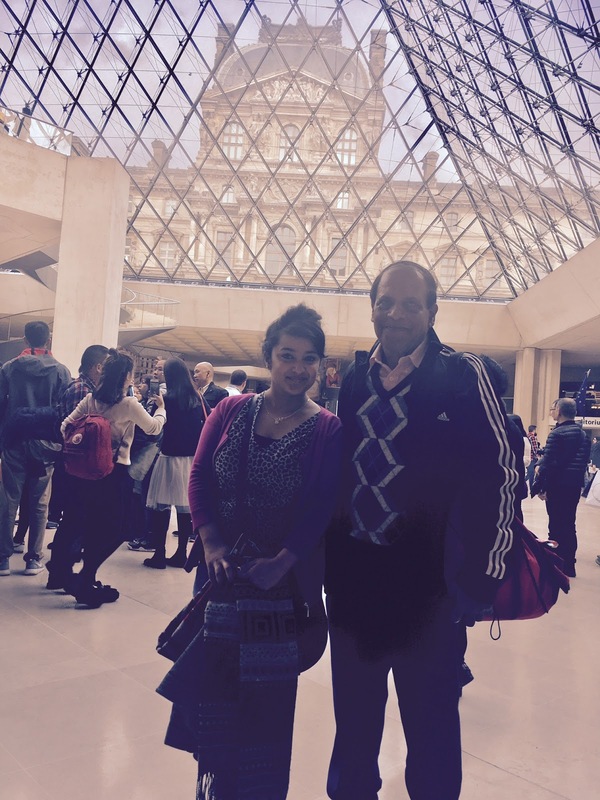 I had never met Ranjana before so the first meeting at Louvre was a great experience. I too look forward to meet you some day soon. Wishing you and Alok a very happy New Year ! What fun to meet a fellow blogger - and in such an amazing setting too! Welcome back! Lovely to meet that way ! Sure was memorable !